For the second straight year, a University of Virginia student entrepreneurship team is at the top of the heap in the Atlantic Coast Conference. Led by Ashwinraj Karthikeyan, a fourth-year student in the School of Engineering and Applied Science, the squad won first place and earned the People’s Choice award at the ACC InVenture Prize competition on Friday night at the Ferst Center for the Arts at Georgia Institute of Technology. In the event, teams of undergraduates pitch their inventions or businesses to a panel of judges in front of a live audience. 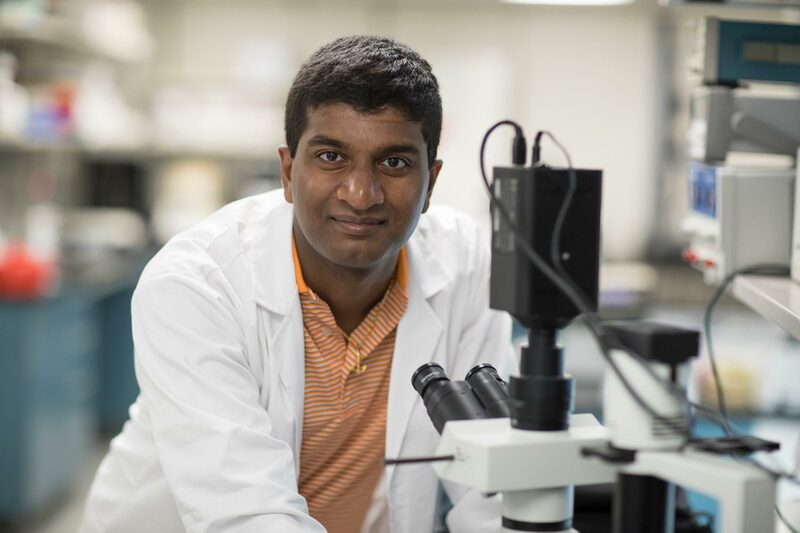 Going up against teams from every ACC school except Clemson University, Karthikeyan pitched a wound site dressing called Phoenix-Aid, which he designed to help diabetic foot ulcer patients. Teams had to survive a Thursday cut-down in which only five of the 14 squads advanced to Friday’s final round. “The ideas this year from our competitors were probably the most impressive and advanced that we’ve seen yet,” said Alexander Zorychta, the School of Engineering’s faculty coordinator for student entrepreneurs. Karthikeyan’s pitch to the judges lasted 2 minutes and 30 seconds. He said the judges then had 7 minutes and 30 seconds of follow-up questions. “It was nerve-wracking,” Karthikeyan said. With its first-place finish, the UVA team won $15,000. It took home an additional $5,000 for winning the People’s Choice award, which had been won the preceding two years by host Georgia Tech. “They usually have a home-field advantage, so to come away with that was really incredible,” Karthikeyan said. In the three years of the competition, UVA is the only school to have placed within the top two each year. In 2016, the UVA startup Contraline – which developed a male contraceptive – took second. Last year, the UVA-founded biotech company Agrospheres – which created a solution to remove pesticide from plants – won the event. Karthikeyan, a native of Chennai, India, became interested in wound care technologies after a former coworker died from a wound that became infected during a routine surgery. Through his company, InMEDbio LLC, Karthikeyan will work on Phoenix-Aid full-time immediately after he graduates in May. Karthikeyan said the plan is for the technology development and manufacturing to take place in the United States, with the initial product launch in India, which has the largest diabetic population in the world. “We think it’s an underserved market and the best place to start,” he said.